The garage, based in Rye, East Sussex has been running 20 years, undertaking a wide range of MOT and service work on all models of car. Business partners Phil Avery and Joel Chandler both enjoy classic car restoration outside of work. It was Joel who found the winning scratch card; he’ll now enjoy a VIP trip with flights and accommodation to Sardinia in June courtesy of Delphi and The Parts Alliance. After some time relaxing on the island, a close-up view of the Italian leg of the WRC rally awaits. The ‘Original Experience’ is supported by Delphi, Comma, MANN-FILTER and NGK. Until the end of March, all qualifying OE quality products purchased from The Parts Alliance member branches will come with a scratch card. 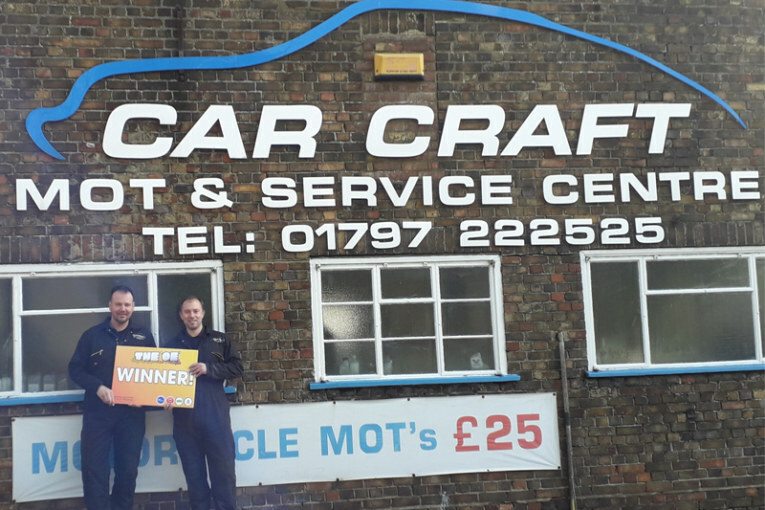 Carcraft MOT and Service Centre prefers to fit established brands they ‘know and can trust’ according to Joel. “We specify Delphi brake pads as they’re quality products from a renowned brand,” said Joel. Amongst snack boxes, t-shirts, beanie hats, wall clocks, mugs, playing cards and more, there are luxury trips still to be won, including a once in a lifetime trip to the Ferrari factory in Maranello, a VIP trip to the GT Series in Germany along with opportunity to drive six cars flat out around Bedford Autodrome during a PalmerSport day. The ‘Original Experience’ runs to the end of March. Garages can find out more simply by contacting their nearest participating branch, or by visiting www.theOE.co.uk. Previous : PMM April 2019 – OUT NOW!